Schlotzsky’s leaps into spring with the return of the limited time only Hand-Carved Sandwiches. From now until May 18, the home of The Original round toasted sandwich will bring back the Roasted Turkey with Avocado & Havarti Cheese, the Hickory Smoked Ham with Bacon, Havarti Cheese & Honey Dijon, and the Braised Beef with Mushrooms & Fire-Roasted Vegetables. Roasted Turkey with Avocado & Havarti Cheese: Thick slices of hand-carved roasted turkey breast, tomato, bibb lettuce, avocado slices, and shredded Havarti cheese with mayonnaise served on Schlotzsky’s signature toasted sourdough bun. Hickory Smoked Ham with Bacon, Havarti Cheese & Honey Dijon: Slices of hand-carved hickory smoked ham, applewood bacon, hearts of romaine lettuce, tomato, red onion, and shredded Havarti cheese with honey Dijon mustard served on Schlotzsky’s signature toasted sourdough bun. Braised Beef with Mushrooms & Fire-Roasted Vegetables: Hearty slices of hand-carved braised beef, Portobello mushrooms, fire-roasted vegetables, and both Swiss and mozzarella cheese with chipotle mayonnaise served on Schlotzsky’s toasted signature sourdough bun. Schlotzsky’s restaurant offers guests more than 15 different sandwiches on its round freshly-baked buns, as well as gourmet pizzas made with Fresh-from-Scratch crusts, freshly made-to-order tossed salads, a variety of soups, and desserts. Catering options are available as well. Lea Dalleggio didn’t want to be a movie star or president of the United States when she grew up. All she wanted to be was an owner of a casual dining chain called Schlotzsky’s. As a child, Lea would travel from her home in Monmouth County, New Jersey to spend summers with her grandmother in Houston, Texas. She started eating at Schlotzsky’s when she was five years old and for two decades begged her father to open a restaurant in the Garden State. Upon her completion of undergraduate and MBA programs at Rutgers University, the 25 year old finally got her wish. 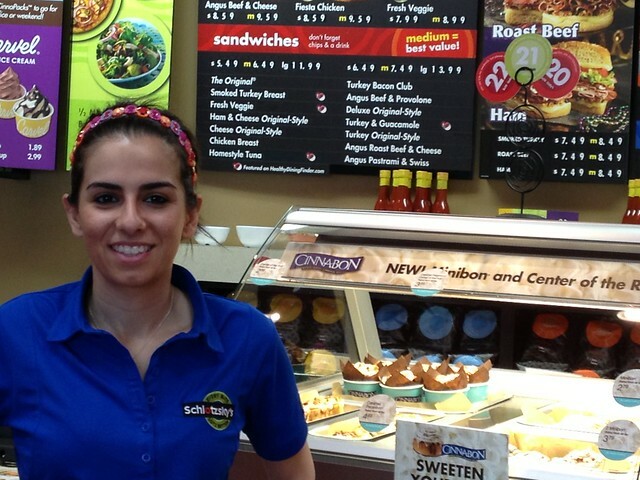 Her father, Anthony Dalleggio, bought the New Jersey franchise rights to Schlotzsky’s as an investment for his family and Lea was soon on her way to running not only her first business, but New Jersey’s first Schlotzsky’s. Dalleggio and her family plan to open an additional 16 locations in the Garden State over the next five years. Located in the Englewood ShopRite Plaza at 39 Nathaniel Place, the casual dining eatery is open Monday through Friday from 8:00 AM – 8:30 PM, Saturday from 9:00 AM – 8:00 PM and Sunday from 10:00 AM – 6:00 PM. The restaurant also offers Cinnabon cinnamon rolls and self-serve Carvel ice cream. The restaurant serves Jersey Roasters Coffee, a blend produced in the Garden State, and will soon offer yogurt and fruit salad breakfast selections. The location has bold, bright colors, making it a good venue for birthday parties and sports team league gatherings. The restaurant offers catering in the region with minimum orders of $30. For more information, call (201) 608-5422 or visit www.schlotzskys.com.